The 2018 rookie wide receiver draft class didn’t produce a lot of players who offered very much immediate value to either their own teams or fantasy rosters. While there were occasional outbursts of production from the likes of Calvin Ridley and D.J. Moore, neither were able to maintain consistent production. Second-year breakouts are not uncommon with wideouts in the league, so let’s take a look at how the 2018 season’s class of wide receivers fared and what to expect going forward. *Note: Player ranks, points and average points per game (PPG) were based off FantasyPros “Fantasy Leaders” report and used half PPR scoring format. 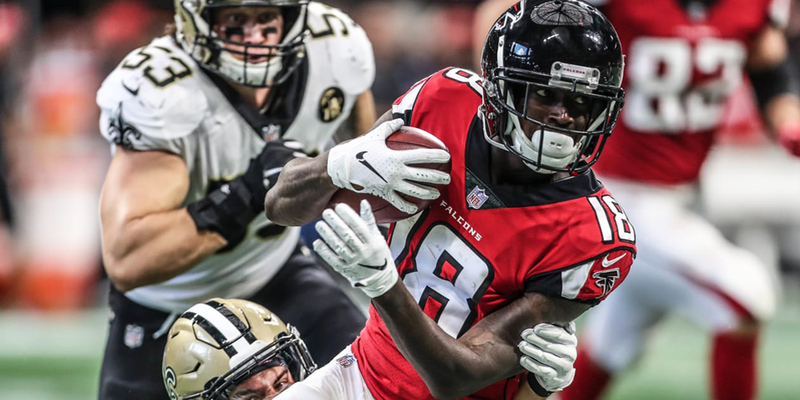 Ridley may not have been the first receiver taken off the board in the 2018 NFL Draft, but he certainly rewarded the Falcons for taking him in the first round. Through the first quarter of the season (Weeks 1-4), it looked like we had a bonafide stud in the making with Ridley. After not catching a single pass in Week 1, Ridley went on to dominate in Weeks 2-4 with 15 receptions for 264 yards and six TDs. Ridley was the overall WR6 averaging 17.8 PPG through four weeks of play and that was with his zero-point Week 1 effort included. Week 4 was the sell-high moment of the season for Ridley as he went on to top 50 receiving yards in a game only three times after that. Still, Ridley finished out the season with an impressive 64/821/10 line as a rookie and gives a lot of promise for the future as Julio Jones gets another year older. Ridley surprisingly finished third on the Falcons behind Jones and Mohamed Sanu in targets, receptions, and yards while his 10 TDs led the team and ranked fifth in the league amongst wideouts. When looking at recent rookie seasons, Ridley compares pretty similarly to JuJu Smith-Schuster’s first year in 2017. Smith-Schuster finished his first year with a 58/917/7 line behind stud wideout Antonio Brown. JuJu, of course, went on to dominate in his second year finishing as the overall WR8 with a 111/1,426/7 line. I wouldn’t be quite as bullish on Ridley’s second year as the Falcons are bringing in a new offensive coordinator and Matt Ryan has been up and down from year-to-year dating back to 2012. Ridley still has potential to cross that 1,000-yard barrier in 2019 though and finish as a top-25 option once again, making him a strong WR2 candidate. We saw some flashes from D.J. 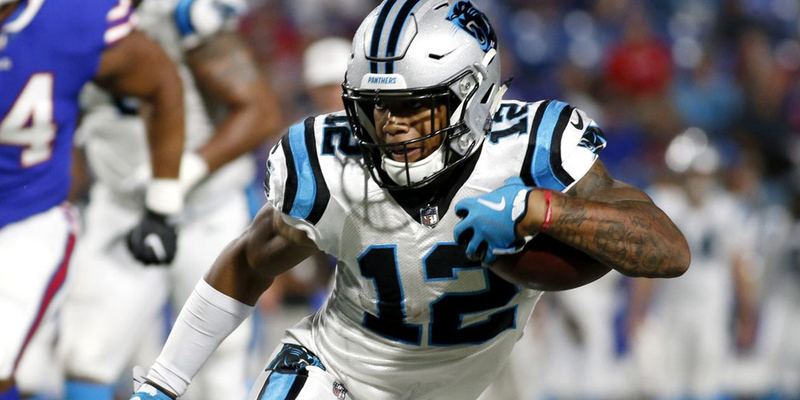 Moore in his first season in Carolina, but an injured Cam Newton and struggling passing game sunk whatever hopes there was for a breakout rookie campaign. Moore’s usage was quite puzzling to begin the season as he didn’t even crack the 50% snap share mark until Week 8. Once he began to get more opportunity, we saw why the Panthers took Moore off the board as the first receiver of the 2018 draft class. Moore shows the ability to be a solid possession receiver who has an ability to create yards after the catch that is reminiscent of former Panthers wideout Steve Smith. Moore is also similarly utilized out of the backfield on occasion on jet sweeps and designed run plays. Though he struggled to carve out a role as a prototypical WR1, Moore did show us the ability to dominate a game, such as his Week 7 performance where he notched seven receptions for 157 yards and one TD against the Lions. Moore’s future is a tough one to predict at this juncture. There are whispers of Cam Newton sitting out the entire 2019 season to get his shoulder right. While Newton has left a lot to be desired as a passer in recent years, a downgrade to any sort of bridge QB or unproven backup would be a huge hit to Moore’s value in a crowded, low-volume wide receiver corps. Based on raw talent alone, Moore gives you a lot to get excited about, but until we see some stability and offensive balance outside of dump offs to Christian McCaffrey, Moore will struggle to ever reach WR1 status. As the Denver Broncos quarterback woes continued, Courtland Sutton gave us a rookie season that left you wanting a lot more. Sutton flashed some big-play potential as a deep threat averaging 16.8 yards per reception. Unfortunately for Sutton, he had Case Keenum as his QB who only dared to averaged 6.6 yards per attempt and locked on to Emmanuel Sanders as a safety valve in the slot. Sutton had some opportunities to stand out towards the end of the season as the team traded Demaryius Thomas and Emmanuel Sanders was lost to injury. Unfortunately for Sutton, he was nowhere near 100% himself and couldn’t quite capitalize. Nevertheless, Sutton finished second on the team with a 42/704/4 final line. Sutton and fellow rookie, DaeSean Hamilton are the obvious heirs apparent for the Broncos receiver corps. A big upgrade at QB will be needed for them to truly reach their full potential. Sutton will likely offer solid value in redraft leagues heading into the 2019 season as he will likely be viewed as the team’s WR1. I would also be looking to buy low on him in dynasty leagues as he offers some vintage Demaryius Thomas appeal as a big-bodied threat that can also stretch the field. Callaway flew under the radar on a Browns team loaded with rookie talent in 2018. Baker Mayfield had an incredible first year under center. Nick Chubb showed the potential to be an every-down back once he got the opportunity to shine. Laying under all of that was fourth-round draft pick Antonio Callaway, who operated as the team’s primary WR2. Jarvis Landry was obviously the focal point in the passing game, soaking up 149 targets. David Njoku finished second on the team, but right behind him was Callaway who finished the season catching 43-of-79 targets for 586 yards. Callaway also led all Browns pass catchers with five TDs. Looking forward, Callaway will likely have to fight for WR2 duties once again next season. With 4.41-second 40-yard dash speed, Callaway figures to fit in more as the occasional deep threat on this offense similar to Kenny Stills or Ted Ginn as opposed to a solid possession receiver. This could offer him some sleeper value as a boom-or-bust WR3 option in fantasy next season on a rising Browns offense. Anthony Miller drew a lot of hype through training camp and the preseason as he was tagged as a favorite to be the best rookie wideout in his class in 2018. Outside of a big game in Week 10 where Miller put up a 5/122/1 line, he was never able to become a focal point of this lower volume passing attack. Miller didn’t record any other games over 50 receiving yards outside of that Week 10 outburst, though he did show an impressive nose for the end zone as he led the team with seven receiving TDs. 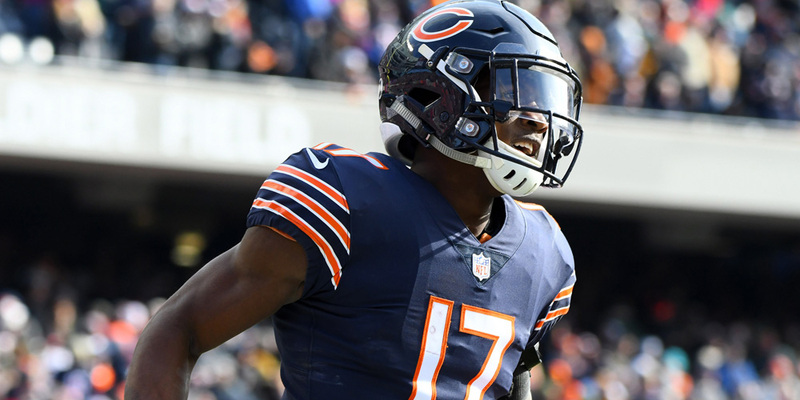 Miller should have an opportunity to surpass Taylor Gabriel on the depth chart come training camp next season as Allen Robinson is expected to maintain his role as the formal WR1. With Tarik Cohen seeing such heavy usage in the passing game, however, Miller will likely fight to fall somewhere in between the second and third read for Mitch Trubisky. The Bears offense is another promising one loaded with young talent. Miller will likely be an intriguing value pick in redraft leagues next year coming off a sleepy rookie season. He could cut out a role similar to how we have seen Cooper Kupp used in the Rams offense as a player featured heavily in the slot who also gets a lot of attention in the red zone. I would throw some offers out for Miller in dynasty as well just to test the waters in case Miller owners have any buyers remorse. Christian Kirk had about as impressive of a rookie season as you’ll get when playing on the leagues worst passing offense in 2018. The Cardinals were just awful to watch but there is a lot of reason to get excited going forward. Kirk flashed whenever he had the ball. He was making plays in traffic and getting something out of nothing a lot of the time. He showed good chemistry with rookie Josh Rosen which will hopefully lead to more explosive performances under new head coach, Kliff Kingsbury. Kirk finished his season prematurely in Week 13, ending the year with a 43/590/3 line. With Larry Fitzgerald questionable to return in 2019, Kirk could wind up the team’s WR1. Marquez Valdes-Scantling was thrust into opportunity in 2018 as both Geronimo Allison and Randall Cobb missed time with injuries. MVS showed the ability to get open deep as expected with his lightning-quick 4.37 second 40 yard dash time and finished as the distant WR2 on the team behind Davante Adams. Unfortunately, this will go down as a bit of a lost season for the Packers as head coach Mike McCarthy was fired before the season even ended. MVS needs some polishing still in his route running but could open the 2019 season featured in three-wide sets behind Adams and Allison, making him an intriguing deep threat option on an Aaron Rodgers led offense. Dante Pettis is likely to gain a lot of hype over the offseason as he offered a lot to get excited about in limited opportunities. Pettis took over as the team’s leading wideout in Week 12 and never looked back. Between Weeks 12-16 Pettis managed three games over 75 yards while totaling four TDs during that span. The 49ers offense as a whole will be trending up with the return of Jimmy Garoppolo and Jerrick McKinnon on offense in 2019. Pettis will have an opportunity to lead an unknown group of wideouts as a second-year breakout candidate. Tre’Quan Smith gave us two weeks of thrill and the rest was chill as he never could carve out a role as the legitimate WR2 for the Saints. Drew Brees spread the ball around a ton in 2018 and outside of Michael Thomas and Alvin Kamara, everyone else was fighting for scraps. Ted Ginn is limping into the final year of a three-year deal in 2019, which could open a window for Smtih to secure that deep-threat niche that Ginn has held fairly well over the last few years. Smith will be an intriguing player to watch over the offseason to see if we get signs of a second-year breakout on the horizon. Robert Foster and the Bills may not have been very good, but they were actually fun to watch and root for in 2018. Foster fit the Bills perfectly on a team of misfits as an un-drafted talent. He proved an excellent deep threat for young QB Josh Allen as his 20 yards per reception led all wideouts according to Player Profiler. Foster also crushed the stat box with 12.3 yards per target (2nd) and 2.25 fantasy points per target (9th). The Bills are seemingly stuck in rebuild mode making Foster’s value going forward tough to predict. A solid showing in training camp and through the preseason would make Foster an interesting late-round flier worthy of WR3-4 consideration and a decent hold in dynasty leagues. Michael Gallup came on strong for the Cowboys towards the end of the season as the team really seemed like they wanted to get him going. Gallup finished the year with a mellow 33/507/2 line but did impress with 6 catches for 119 yards in the team’s playoff loss to the Rams. Gallup is a bit of a mismatch running as more of a deep threat on a team that prefers a more conservative passing game. It will be interesting to see how a new offensive coordinator utilizes Gallup in 2019. He also remains a solid hold in dynasty leagues but will need to show a lot to offer value in redraft leagues in 2019. DaeSean Hamilton and Tim Patrick got some opportunity to shine after the team lost Emmanuel Sanders to a torn Achilles after Week 12. Losing Sanders especially boosted Hamilton’s value as a primary slot option while Patrick benefitted more from the trade of Demaryius Thomas. The Broncos got decent production of out their three rookie wide sets towards the end of the year. While Courtland Sutton was already gassed and dealing with injuries towards the end, Hamilton stood out as the most polished receiver of the bunch. With Sanders likely to start 2019 on the PUP list – if he plays at all – Hamilton will make an intriguing WR3 in 2019 no matter the QB situation. James Washington was used sparingly in his first season as he could only muster a 16/217/1 line in a year that saw Ben Roethlisberger lead the league in passing yards. Washington showed some value as an occasional deep threat but didn’t look anywhere near ready for a role as an every-down player and was even a healthy scratch on some game days. With Antonio Brown on the outs, Washington could get a solid opportunity to slide into the teams WR2 role with a good showing in camp. I would hold Washington in dynasty if you can as an end-of-bench option.